This book provides insight and techniques to position you for a new lease on life. You will find tools to get jump started today! Livn’ Fit the Transformation is a 21-Day “Shred-It” Gourmet Meal Plan and Exercise Regimen that has been designed with you in mind. This book provides insight and techniques to position you for a new lease on life. You will find tools to get jump started today! 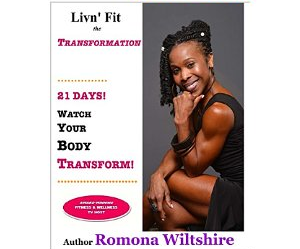 Livn’ Fit the Transformation is a 21-Day “Shred-It” Gourmet Meal Plan and Exercise Regimen that has been designed with you in mind. You’ll be introduced to new perspectives on how to feel better. You’ll learn how to lose weight quickly, safely, and effectively with delicious, nutritious gourmet meals that can be prepared within 15-20 minutes. For 21 days, you’ll be given easy-to-follow recipes and snacks to gently guide you into a new way of experiencing and enjoying food. You’ll feed your mind, spirit, and soul with daily inspirational quotes and affirmations to carry you along your journey. The Plan also includes a Daily Meal Tracker – your transition tool to move from the Plan to your new lifestyle. The quick and simple exercises are designed to use large muscles, shred fat cells and burn maximum calories in less time. Clear, colorful photos and the companion DVD (optional) make it even easier to follow along.